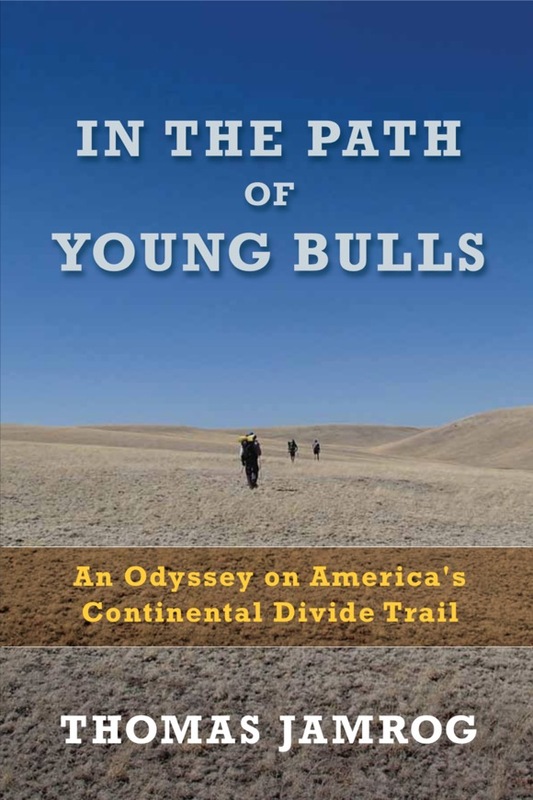 Today was spent on getting to and then hiking a section of the Continental Divide Trail. I have Andy’s truck, Lincoln and Stephanie are working, and the weather looked as good as it ever is here this here, so it happened! 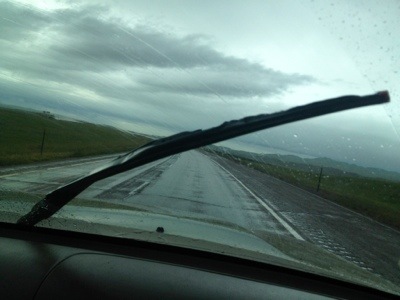 The start was a fast hour and a half west, to the Homestake Pass exit . There’s a “Continental Divide Trail/ 6329 feet” sign right on the CDT over I-90 right there. I parked the truck, and took off. I was packing bear spray, actually I clipped it to my sternum strap. There is no use in carrying bear spray unless it is right there to grab and use. I’m no expert, but know that. What I have never done is actually fire a can of bear spray. Lincoln had me operate it right up to pulling the trigger, but I wouldn’t have known that you aim at the ground in front of the bear then lift as the stream is visible. Before I return here, I plan on buying a couple of cans and shoot them around at home. The trail is a relatively new segment, with excellent tread, that winds along , steadily uphill, weaving between large uplifted outcrops of rocks. There were zero streams or water sources. 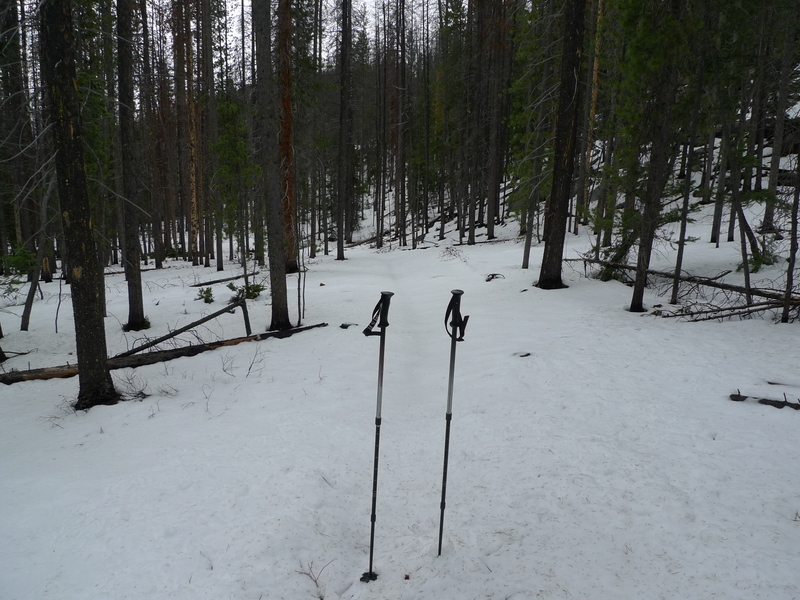 Right from the start, there were sparse patches of snow on the ground. The snow maintained an intermittent depth of just 3-4 inches until the elevation reached 7,000 feet, when it covered all the ground, increasing to a maximum depth of 6 inches near the 7,500 foot summit high point. From there it descended south to Route 2, but I turned around there and went back. Or I did my best to do so. I had a bad situation come up when I became faint after leaving the trail to stand on the high point. I don’t usually get like that. I sat down to collect myself, and drank more water, ate a Sweet and Salty Nut Bar, and then started on down the way I came up. 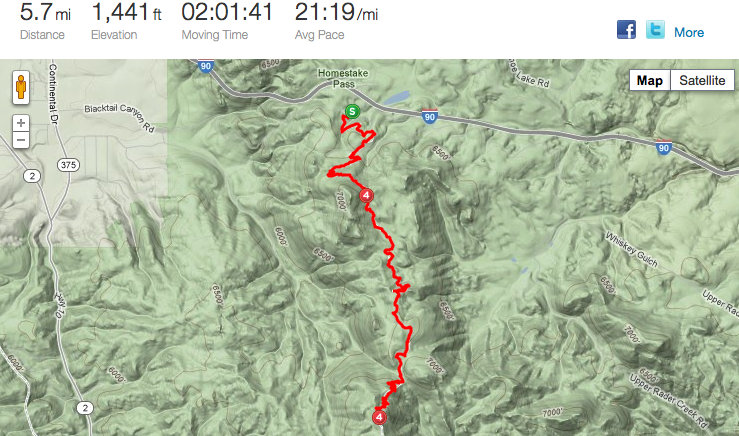 I had made very good time in getting to the top, 2.8 mph, but apparently my lack of conditioning for this elevation, and my overall physical state, resulted in true difficulty in getting myself back to the truck. I’m pretty good at descending, and today was mostly sloppy skiing, but on those few instances where there were uphills on the down hill, if you know what I mean, I moved at a slug’s pace. There was also this black wall of cloud coming right at me from the west that I wanted to beat to the truck. I made it without further incident, but so tired! It was incredible to look out from the top to see Butte sprawled out on the side of one mountain, and that 600 foot Anaconda smokestack off in the far distance. I hope to be back here, sometime next September ? How to Follow Andy ? My most faithful blog reader, and hiking budddy Tenzing (AKA Clarkie) posted the question many are pondering today: “How can we keep up with Andy’s adventure now that you have left him? My answer is that I am not sure. I will try and post any updates I get here on this blog, which automatically is set up to report to both my Twitter and Facebook accounts. There is also a website set up about Andy’s Ride that allows you to follow him, get more info about the Tour Divide, and make a pledge that will support the nonprofit Camden Rockport Animal Rescue League. Reader Bill Dickey forwarded a link to Andy’s Spot device which is currently tracking his progress. I highly recommend that readers also watch the 2008 documentary Ride the Divide, an award-winning feature film about the world’s toughest mountain bike race, which traverses over 2700 miles along the Continental Divide in the Rocky Mountains. The film weaves the story of three characters’ experiences with immense mountain beauty and small-town culture as they attempt to pedal from Banff, Canada to a small, dusty crossing on the Mexican border. Appleton Ridge’s own Stephen Gleasner completed the 2008 race and appears in the massed start in the film. The film is now available through Netflix, either as a stream (instant), or DVD in the mail. I have a copy at home if any of my friends or neighbors want to watch it. Call Marcia. I just received a call from Andy this morning. I am relieved that he did call me, and will be able to in the future. I made sure to program my number in his contacts list on his cell phone, as he claims all the ones he put in there were erased. Andy’s already altered his plan. Mike won’t be driving Andy to Rooseville. Instead, Andy will be packing up today and riding his fully-loaded bike those 60 miles, on an asphalt road, up to the Canada border. He’s restless, and is compelled to ride, as he has done almost daily for the past several years. It’s in his blood . He plans to either get a motel room, or camp at the end of the ride to Rooseville. I hope he takes the motel room, as he’s never done this on his own in the thirty years that I have know him, but should do OK. He will have to, sooner or later. Motel arrangements by phone, and subsequent motels stays are a salvation to long-distance endurance athletes, at least they are for me, generally on a weekly basis. You use their land lines to connect, call manufactures about gear failures, fix or stitch up broken or torn items, connect with family, wash your clothes, repack food you buy in town, and generally hole up and lick your wounds, check maps, and prepare for what’s next. It can be scary, and I know what it is to be homesick, even as a grown man. Andy claims this was his original plan, and he’s one to stick to initial decisions. For example, I couldn’t convince him to change his clock to Mountain time for the duration of the trip ( a two hour change in time from Maine). So his clock will be two hours skewed from any other clock in the “real world” out there. He’s holding onto Maine time. I’m hoping Andy will check in with me, as he does with his wife Judie, but phone contact will get tricky in Canada. Andy’s on a limited Verizon plan, where once you cross into Canada, exorbitant, insane, roaming charges kick in. I understand that if you call Verizon and let them know you are entering into Canada, and refrain from data usage ( texts, web access), for about $20 extra bucks you can use your cell phone, but I don’t thing Andy knows that, or even if he did, would have the patience to endure the rather lengthy and mostly unsatisfying customer services exchanges that seem to be the norm with them. 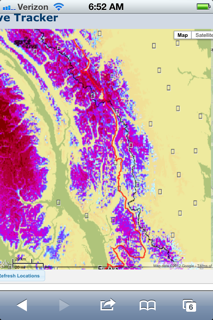 When I was in Vancouver for three days in 2010, staying with Dusty at the end of my Pacific Crest Trail thru-hike, I used my cell phone sparingly, and was shocked beyond belief when I got home and opened the monthly bill to see that I was assessed an additional $690 in international roaming charges charges. So I advised him not to use that phone from tomorrow, or even today until he gets out of Canada, which may mean a couple of weeks until he returns into the US after the June 8 start of the Tour Divide. In the meantime, he just bought a phone card, which will allow him to make calls on a land line at a reasonable rate. Sounds easy, but in reality it is not. Land lines are only in private homes and businesses, and they are in motels, and pay phones are a rare breed these days. The problem is Andy’s not used it yet, and there are things like an international codes for the US that has to be entered as part of the dialing sequence. Sometimes riding one’s bike, or hiking is the easiest part of these extended trips. I know it is true for me. I generally am terribly stressed out and get into all sorts of trouble when I go into a town after a week of hiking- not police trouble ( that’s another story) but losing-stuff trouble, like clothing, glasses, wallet, Passport, or debit cards, which I am embarrassed to say has happened to me. I can’t even think clearly enough to buy groceries in a big store and once even begged my hiking buddy General Lee to let me follow him and just buy what he bought. 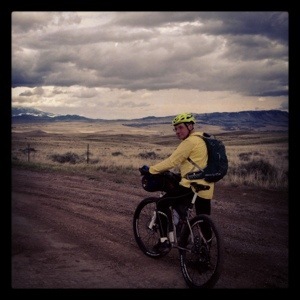 You will be able to follow Andy’s progress on a daily basis after the race start on June 8 by going to the Leaderboard on the Tour Divide web site. For a taste of what he is facing in the next few days, go to the Leaderboard, then look on the right pane, and select Map Layers . Then check Snow Depths, and view the purple sections are still reporting snow on the route. I enlarged the Canad portion of the map and this is what Andy will encounter on his ride up to Banff. Looks pretty purple up there to me. 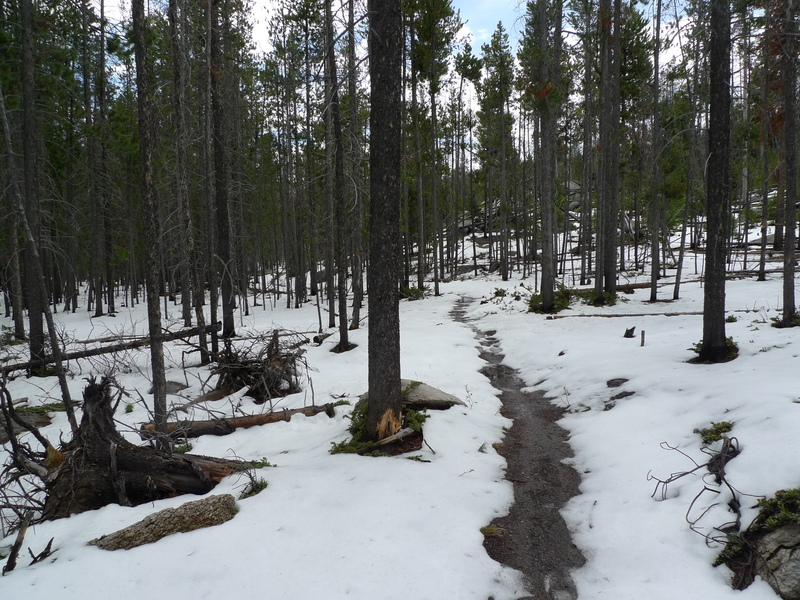 Whether there will be much melting of these sections between now and after the start on June 8th is anyone’s guess, but after the snow melts there will likely be mud instead, which may not be much better . Newspapers should also be covering portions of the ride. Just this morning, while eating breakfast in the Montana Cup I read in the Bozeman Chronicle that there is a 152,000 lightning-sparked wildfire burning in the Gila National Forest. More than 1,100 firefighters and nine helicopters are fighting it’s expansion. It is 0% contained, despite the millions of dollars that are being thrown at the fire in daily services. Although this year has a close to record low snow pack on the high mountains, persistent droughts and a “record breaking dry air mass” are fueling the fire. I don’t have a good map with me here, but I suspect that the proximity of the fire to both Silver City and Pie Town will force evacuations and possible closures in the area. Who knows what will happen by the time Andy reaches the area toward then end of his ride, but this is definitely not good. Thunderstorm season is upon us in the southern portion of the CDT, and more fires are likely, triggered by lightning. It is hard for easterners to conceive of this, but these wildfires are common in the windy, dry, desert areas. This particular fire is one that may break all records for that area of New Mexico, and soon. The featured attraction of this morning’s truck ride was viewing one of my favorite towns, Butte, from the highway. Flanked by the gaping maw of the Berkley Pit, the mountainside town looks uneven, slanted even, as it is perched on the side of a mountain. By 11AM Andy was at the wheel making time on route 200 toward Whitefish when the thermometer dropped into the forties, the skies darkened, and cold rain dashed against the windshield. Lincoln was riding in the back seat of the pickup, and it rained hard enough that he opened the back window, and hauled all of Andy’s gear into the back seat. At some point, we left I-90 and struck due north through increasingly wooded and sharply elevated mountains, stopping for a quick sandwich at Seely Lakes. Some 7 hours later, we arrived at Whitefish, the final destination for the beer truck, some 60 miles south of the Canada border. 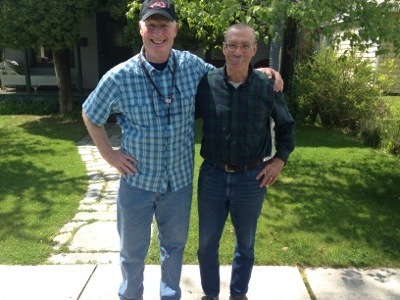 Andy tracked down his childhood best friend, Mike Fitzgerald, who lives there. Andy will be staying with Mike for two days. 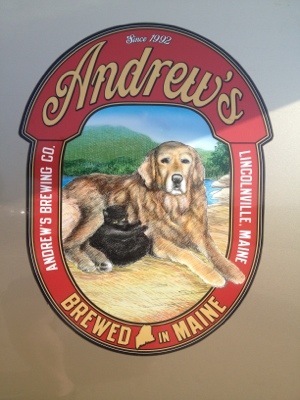 Andy shed another layer of protection and familiarity when he left the comfort of his beloved truck, handed over the keys, and said goodbye to his last Maine connection- me. I had to make our goodby quick. I started to tear up. I so much respect and support what he’s going to do. Andy’s been my neighbor and friend for 33 years, and I consider myself privileged to haven ridden bikes together and to have played my part in this most unique adventure. I have come to believe that Andy’s plan on coming out here early is a masterful decision, one that is rooted in wisdom, shrewd tactics, and a brave heart. He’s going to be better acclimated to the increased altitude in the mountains, and will start the race on hundreds of miles of familiar terrain. Miles on the course, but Andy is. Andy’s representing High Street, Lincolnville, Maine, and all of New England when he pushes off at the start line on June 8 at high noon. He’s worked so hard and long to be ready, and a force bigger than we can understand is gathering within him to lift him along the 2,700 mile Continental Divide and bring him home. Life is good in Montana. Andy and I had the downtown tour of Livingston, MT this morning. It’s very satisfying to wake up and realize that we did not have to drive for a whole day. Walk out the door and a few minutes later there’s the Yellowstone River, then there’s Main street and the downtown. After we adjusted bikes, and cleaned them, Andy, Lincoln, and I put up our ultralight tents – Andy has the Z-Pack Hexamid , Lincoln the new Contrail, and I set up the Moment. In the afternoon, Lincoln, Andy, and I went for a bike ride of almost two hours, right out the door from here on 9th Street. 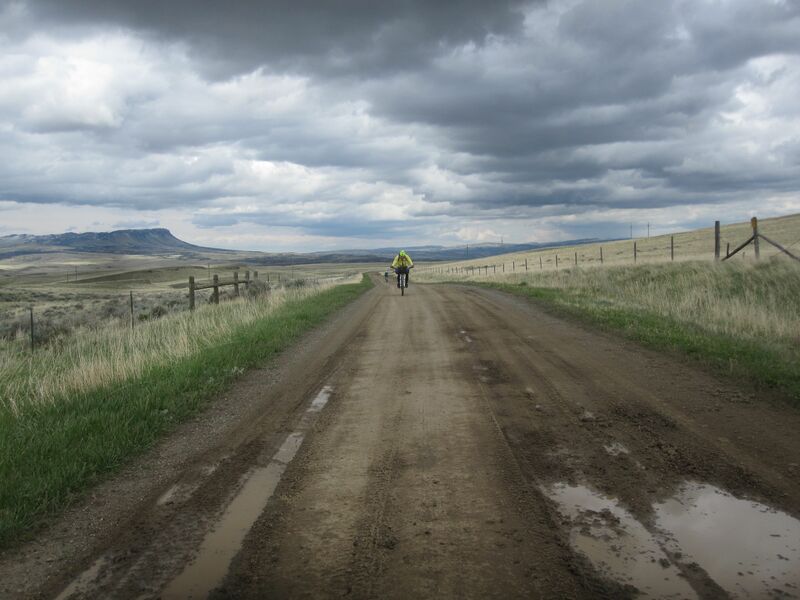 After a few miles on the pavement out of town, we climbed up onto some high hills and just kept up on a roller coaster of a rutted gravel and mud back road. It got to the point where the mud increased- the driver of a pickup truck coming toward us rolled down his window and advised up that it got increasingly muddy and rutted ahead, so we turned back and wound out way back. Dinner was at the Murray, where us guys and Stephanie each ordered a specialty wood-fired oven pizzas for $5 and sampled some local drafts. It’s much colder here than I expected- 30’s this morning, and there is lighter snow down to 5,500 feet, with thick cover above 7,000 feet. On the road this morning at 5 AM. 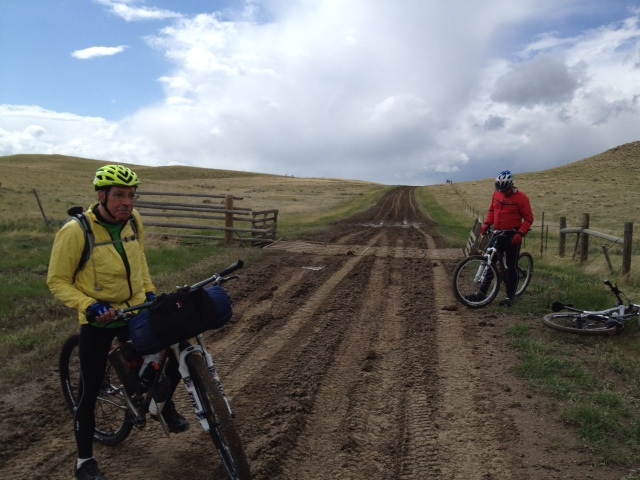 We’ve turned over 1,100 miles today and are just about to finish in Livingston, MT. The logo on the beer mobile reminds us of how far we’ve come. My biggest challenge last night was escaping the locked bathroom in our room at the Econolodge, in La Cross, WI. It was 3AM when I groped my way in to pee, and closed the door so that I wouldn’t wake up Andy when I flushed the toilet. Then I couldn’t get out! The inside doorknob spun around, and no amount of pushing, pulling, and cursing got that door open. Earlier, I had woken up Andy once already when I grabbed the wrong card off my nightstand last night, thinking it was my room key/card in a trip out to the truck. I thought to myself, what if I were alone in this room? I had no shoes on, so I would cut up my foot on the luan paneling of the door if I kicked my way out, and there was nothing in the room but a toilet and a tub, so I couldn’t pry the lock open. Ten minutes of my rattling and increasingly loud knocking got a pissed Andy out of bed. “Now what, ” Andy grumbled when he released me from my toilet captivity. He tried from behind the closed door, and couldn’t get out either. 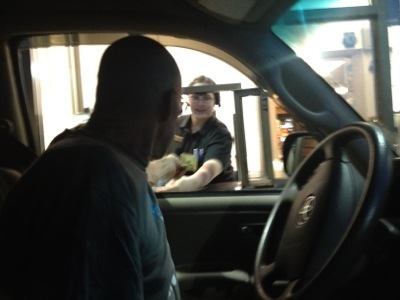 It was still dark out when we hit the drive-thru at McDonald’s. I gave Andy his first lesson on how to order from a drive-in window. After reaching the border, Wisconsin was easy. But, South Dakota ground us down. 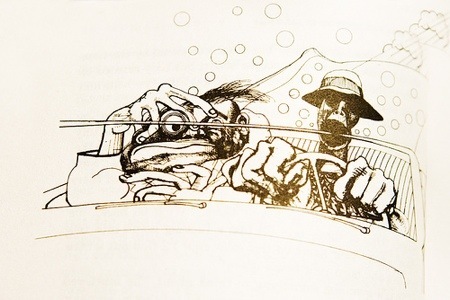 Andy was in the driver’s seat and clicking the cruise control to 75 failed to remedy the mind- numbing highway hypnosis of I-90’s straight track west across brown and green farmlands that stretched to the horizon on either side. At 4:45 PM we crested an uphill in Wyoming at 5,340 feet elevation and had our first view of the Absaroka Range, with some peaks above 13,000 feet . We were silent, undoubtably feeling both majesty and fear as we took in the snow covered crests. We can’t go over them, so I-90 veers right, heading north into our last and final state today, Montana. We started riding at 5 AM and should end by 10 pm, soon. 17 hours on the road. Andy might have to do that some day soon, and more than once, on a bicycle! 800 more miles today for the Tundra beer transporter, on top of yesterday’s 644. In Le Roy, NY we were dismayed and too early to view the Jell-O Museum. Although it was Saturday, it still was bumper to bumper around Chicago through the middle of the day when it hit 90 degrees out. Andy’s keen on leaving the air conditioner off. He claims he can see the gas needle go down at 70 MPH, which is our speed routine- with the cruise control engaged. Andy told me today was the first and will be the only time he ever takes I-90 through Chicago. He was worked up while we suffered the worst of it, coaching me how to drive, and pleading with me not to get in an accident as little bizarre souped-up cars were jacking lanes and injecting terror into our veins. 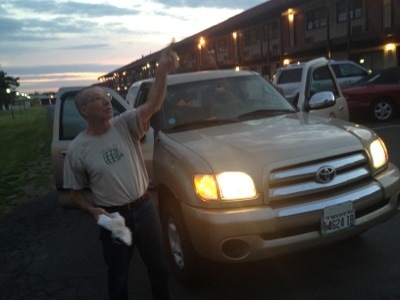 I was more than concerned that Andy’s giving the finger to one road- raged driver would result in retaliation. He needs to be ready to ride! Right now, a high point- we just realized that we went through a time zone, so it is only 6 PM local time, instead of 7. 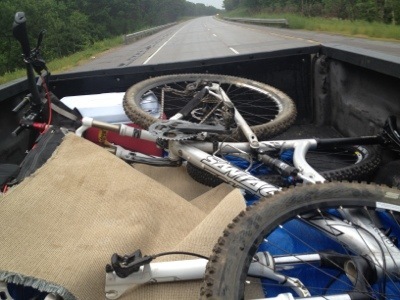 It’s raining, but the bikes are dry in the truck bed. We just ate at a Chinese buffet. Andy sure doesn’t eat much and he seats slowly. That has to change if he’s going to make his 22 day goal. I am desperate to watch the final game of the Celtics Philadelphia 76’ers , played at Boston Garden. Could be an adventure brewing for me in locating that game in La Crosse, WI if the Econolodge cable lineup is deficient. Andy is sitting in the driver’s seat,shaking his head. “You are crazy. We need to have you in a good mood and up at 5 AM tomorrow. Just go to bed and look up the score in the morning.”. 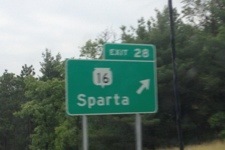 A sidebar glimpse, we just passed – “Sparta, the bicycling capital of Wisconsin. Celtics are ahead. There’s hope! Further hype fuel. 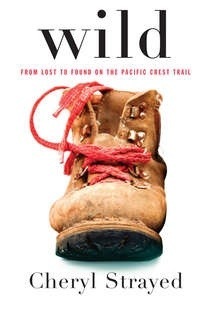 Reposting a gushing interview with Cheryl Strayed, author of Wild, a book about her 1995 hike on the PCT. I reviewed Wild recently. Made 644 miles on our first day yesterday. Had to rely on the iPhone last night to secure a room. Don’t give me no crap about electronic tools. Friday night into the holiday weekend resulted in some full motels. The phone connected us to a Econolodge motel around Buffalo that was right near I-90, that I reserved from the Tundra. Andy got his first lesson today on how to use a debit card in a gas pump. Tomorrow’s workshop will be “Andy faces an ATM machine”. The pic above was taken at 5:25 this morning when Andy was exited to see a seagull from Maine that must have followed us out here. I’m pleased to learn that Andy is also an early riser. Team High Street up at daybreak to get ‘er dun! Road trip to Montana ! We left High St. In Lincolnville, ME at 8 this morning, with no real plan of where we may end up tonight. We could camp or motel it. We have a drive of some 2,500 miles to our initial destination of Livingston, MT, where my son Lincoln has a home. Conditions are good- overcast, not hot, traffic reasonable. It was an emotional departure this morning- this is a big deal. Andy doesn’t get out much. He just told me that the last time he was in Western Massachusetts was in 1971. I’m assisting getting Andy up to Rooseville, MT where we will part and he’ll ride his bike 280 miles north to the race start on June 8. I have my own bike in the back of the truck and plan some rides on and around the Continental Divide Trail. 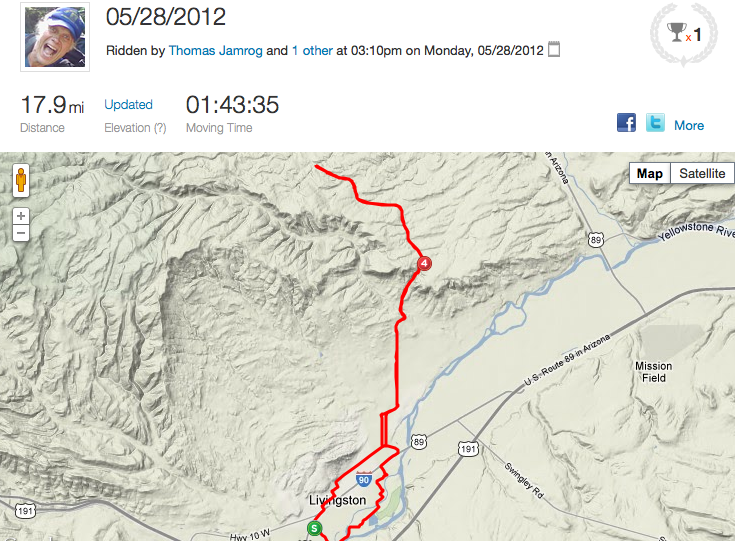 Yesterday, I was compelled to walk 4.7 miles in 1 hour and 6 minutes. That’s pretty fast. I recorded the hike on a map listed via Strava. I didn’t want to trudge through the woods due to mud, wet, and the possibility of peeling tics off my body in the newly sprouted grasses. So, I just walked out the door and moved for a bit over an hour on the pavement. It really felt great. I had missed real exercise for a couple of days and was compelled- actually ejected out the door, as my body craved The Pump. I improved my time by almost 10 minutes over a previous walk on the same route. How? 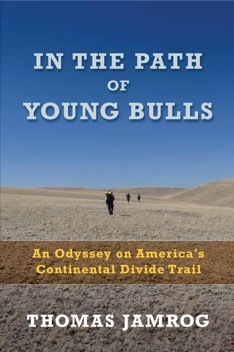 This is the time of year when I like to read about hikers starting and hiking the long distance trails- AT, PCT, CDT . Hikers issue blister reports, and request and advise each other on what the best footwear is to wear on these hikes. They have it all wrong. It’s not about the actual footwear, you can buy excellent insoles that can take up the slack on the bottom. For sure, most hikers’ blister issues are due to wearing runners or boots that aren’t big enough, but no one likes to hear that, especially women. Any potential thru hiker needs to visit the best sports podiatrist they can find and have their gait evaluated. Most foot problems arise due to biomechanical abnormalities that are associated with whacky gait issues. 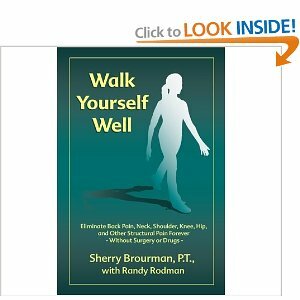 Along with the podiatrist, potential hikers are advised to read Sherry Brourman’s Walk Yourself Well. The book is the next step in resolving any biomechanical deficiencies. I am now able to walk faster and with no blisters on my hikes after altering the screwed up gait that my podiatrist verified. I followed Brourman’s specific recommendations for my particular gait flaws. In my case, I had to re-learn to walk with a slightly wider and slightly longer gait, while favoring the placement of my heel strike toward the inside of the heel. It took me months of practice, starting with one of those the corrections and adding the other two. It works! It is now automatic. I’m definitely faster, even without moving my legs any quicker. The slight two inch increase in my gait adds up over the course of a day, resulting in more miles, in feet that are not as battered up as they used to be. So forgo the footwear obsession- consider averting the problem before it comes.